Here is a eclectic blog on everything from sprouts to cookies to drug store Christmas trees. Brussel Sprouts have now been added to my "Vegetables I Love" list. I have to admit I have never eaten them before. It is embarrassing, being the veggie connoisseur that I am...But it is never to late to change. I love them. And my children ate them. Admittedly a bit begrudgingly, but it was definitely not a battle....just some gentle coaxing and (here comes a confession) spray butter. I know. I am so natural, and I shun with a passion almost every unnatural processed thing, but I found spray butter to be an acceptable evil. It has fewer than 10 ingredients (a good thing) and if I put a bit on vegetables my children will gobble them up. They don't like the real butter on them. So...for the sake of high, desirable veggie consumption we use "I Can't Believe It's Not Butter" spray. I did find this brand to be the most "natural" (I feel awkward even using that word when speaking of butter in a bottle) of the varieties. If you want to stop reading go ahead. We all have our vices. Spray butter and chocolate chips happen to be ours. 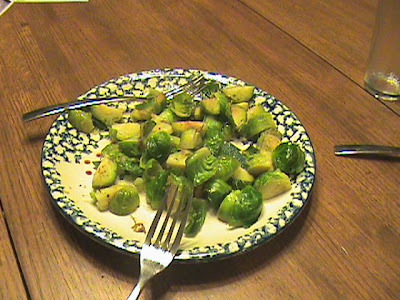 Here is the recipe for the Brussel Sprouts. These recipes are courtesy of my sister's friend Candice. We did a recipe exchange, it has been so fun. I love sharing yummy recipes...hint, hint, to any of you friends out there with delicious recipes...do share! Sauté Garlic in olive oil. Add Brussel sprouts, olive oil and lemon peel. May need to add a bit of water or broth. Cook (covered some of the time) until desired tenderness. Sprinkle with sea salt and parsley. I had some left over uncooked sprouts and sauteed them the next day and added them to a great Thai dish. Speaking of chocolate chips...Candice also had a new recipe for refined sugar-free chocolate chip cookies I actually like. They are vegan too. My girls and I can mix these up in under 10 minutes. Preheat oven to 350. Mix all ingredients. Drop spoonfuls onto baking sheet. Flatten. 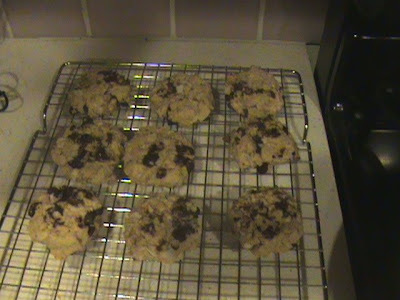 You may want to flatten 1/2 way through cooking as well (These cookies will not spread by themselves. Refined sugar gives cookies that nice spread) and bake 15-18 min. A few tips...these are not the greatest warm, much better cool and dipped in milk. If you are eager to try them, restrain yourself until they are cool. But feel free to indulge on the batter...it is egg free and delicious! 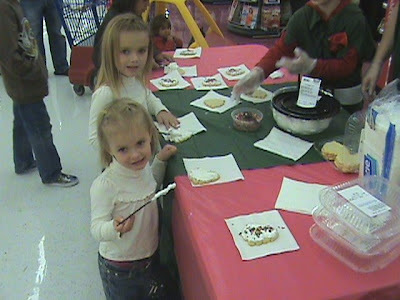 ...Not so delicious...the Harmon's grocery store decorating cookies. These little nasties were pure hydrogenated shortening I am certain. I think we were able to have them "accidentally" get covered in pine needles from the Christmas tree in the back of the truck, on the way home, only a few deathly bites into them. The cookie decorating came during our traditional outing to"cut" the Christmas tree (we found the prettiest one in the Rite Aid lot), and visit Santa and get a picture (free, not the price gouged ones from the mall) at the grocery store. BTW...my camera is finally en route back to me. No more grainy madness! Hello Rebecca! When I became health conscious, one of the first foods to go where dessert/snack-related, and one of them is the humble cookie. Your use of coconut/coconut oil in your "Refined Sugar Free Choco-Oat Cookies" should make this a guilt-free dessert/snack from where I'm standing. Thanks a lot! Would you be willing to post the graham cracker recipe? We have a firepit in our backyard and my kids love smores but I'd like to reduce the sugar content if possible and, since you can't have smores without the marshmallow, I thought the graham crackers would be the way to accomplish it! May 5th. Let me know if you have any problems finding it! the above is a link you can cut and paste if you have an issue. I wish the marshmallow recipe I have toasted. They taste great but melt instead of toast. Hey I am a friend of Marie Glan and she told me about your site, it is very fun! What kind of dark chocolate chips do you use? Where do you buy them? I have just used the Ambrosia brand from Costco. However, I don't know if you saw the recipe for homemade choc. chips I posted in January. They are awesome! Although I haven't tried them in cookies yet, only ice creams and snacking. I will let you know when I do try them. Hello! I simply would like to give a huge thumbs up for the nice data you have got right here on this post. I will be coming again to your blog for extra soon. Reunited and It Feel's so Good!